Washington Free Beacon review finds campus branches of J Street have been helping anti-Israel activists gain support for BDS resolutions. Campus branches of J Street have been helping anti-Israel activists gain support for student government resolutions calling for boycotts of Israel, the Washington Free Beacon revealed, following a review it held of Boycott, Divestment and Sanctions (BDS) campaigns on college campuses during the recently concluded 2017-2018 school year. 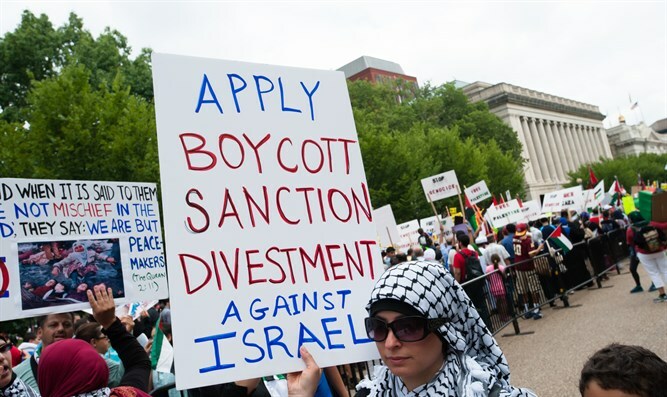 The review found that at many schools where boycott and divestment campaigns have taken place, J Street chapters provided key assistance to BDS activists through statements, lobbying, and activism that fueled the anti-Israel climate on campus and reinforced accusations against Israel made by BDS groups. Despite J Street’s claims that the group is an important progressive opponent of BDS, at many schools J Street chapters did not oppose BDS campaigns and sat on the sidelines during contentious fights over student government divestment resolutions, found the Free Beacon. The revelations, compiled from interviews the website conducted with campus activists and pro-Israel professionals who fought BDS resolutions this year, call into question the group's publicly claimed opposition to the BDS movement. The Free Beacon noted that Catie Stewart, deputy director of J Street U, recently boasted that her organization "does not support Israel Apartheid Week or BDS campaigns and joins anti-BDS coalitions." The statement endorsed voting in favor of the boycott resolution and said, "If you plan to vote this week, at the very least make sure that whatever position you take is supported by rigorous fact-checking and independent inquiry." The Barnard BDS resolution passed, noted the Free Beacon. After the bill was voted down, J Street's University of Maryland chapter posted another statement declaring that while "this bill was not the proper response to human rights violations committed by Israel against Palestinians, neither is blindly celebrating the rejection of this bill." J Street then asked students to join its campaign attacking Israel for demolishing the homes of Palestinian Arab terrorists, and promoted the screening of an anti-Israel film. "I was discussing our tactics for fighting anti-Semitism and BDS with a person affiliated with J Street," one pro-Israel student leader told the Free Beacon. "They advised me not to speak at the [student government divestment] hearing because my voice would not make a difference. They told another person that by speaking out against it they would have a target on their back and that it might not be worth it in the end." J Street has in the past expressed support for BDS of Jewish goods made in Judea and Samaria.